Background: Teeth with severe crown destruction and endodontically treated may or may not present a circular strip of dental tissue located in the cervical region called ferrule. Aims: The aims of this study were to evaluate ferrule thickness influence on endodontically treated teeth (ETT) resistance to fracture. Materials and Methods: A total of 30 bovine incisor teeth were selected, endodontically treated and randomly distributed, according to the ferrule thickness: G1- no ferrule, G2 – 1 mm, and G3 – 2 mm. All the teeth were restored with prefabricated posts and composite resin. Resistance to fracture was established as the compression strength at 45° tilt at the lingual surface of the crown. Statistical Analysis Used: Data were analyzed using ANOVA and Tukey's test. 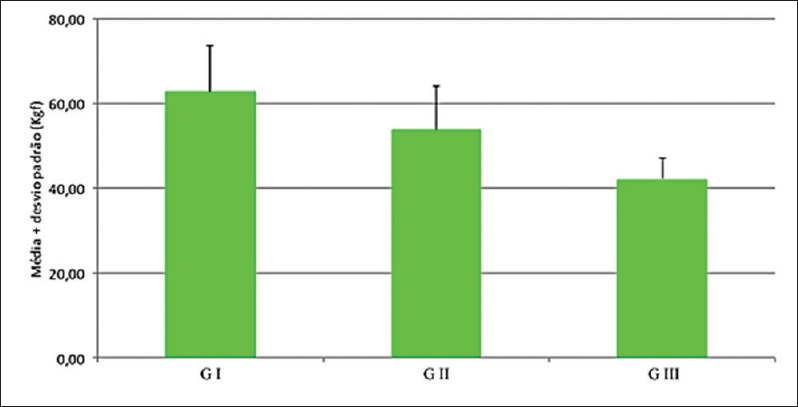 Results: Resistance to fracture of G1 and G2 were significantly higher than that of G3 (P < 0.001). The pattern of fracture, common to all groups, occurred at the composite resin on the coronary portions. Conclusion: Ferrule thickness can influence the resistance to fracture of ETT. The presence of ferrule associated to the placement of an intra-root post can reduce the incidence of catastrophic fractures, disabling the dental remnant (i.e., far below the amelocementary limit), since it allows the occlusal forces applied to the tooth to be transmitted to the cement-enamel junction and, if fracture occurs, it will tend to be horizontal. In the absence of ferrule, the occlusal forces are transmitted directly to the root, resulting in root fracture. Thus, the ferrule allows the stress to be distributed to different tooth surfaces, along with the thirds. Several works report that the presence of a 1.5–2 mm long ferrule can increase the resistance to fracture of endodontically treated teeth (ETT);, however, the current literature lacks information on the ideal thickness of the ferrule. Thickness is usually related to the remnant tooth structure after endodontics and to the amount of dentin that needs to be removed during crown preparation, which depends on the cervical end design and on the type of crown. The aim of this work is to evaluate the influence of ferrule thickness on the resistance to fracture of endodontically treated bovine teeth, taking into consideration the different fracture modes. The null hypothesis considers that ferrule thickness does not influence fracture resistance. The materials used in this study are described in [Table 1]. Thirty bovine incisors were selected for the analysis. The teeth were stored in thymol solution (0.1%) for 24 h. Crowns were sectioned transversally with a double-faced diamond disc (KG – Soresen- Brazil), followed by root conducts instrumentation with Gates Glidden drills (Maillefer-Dentsply-Brazil) #3 and 4, at 20 mm length. Sodium hypochlorite (2.5%) was used to irrigate the canal during instrumentation. The root canals were dried with air jets and absorbent paper points (Tanari -Tananman Industrial Ltda - Brazil), and the filling was done using hydraulic compression with gutta-percha cone (Maillefer-Dentsply-Brazil) and endodontic cement (sealer 26® – Dentsply - Brazil)). Once the filling was completed, the roots were cleaned with alcohol-soaked cotton pellets, and the coronal access was sealed with a cotton pellet and Coltosol® (Vigodent - Rio de Janeiro, Brazil). After the endodontic treatment, the post space was prepared for the prefabricated posts with a Largo drill number 5 (Moyco Union Broach, USA) in slow rotation, standardized at 15 mm and avoiding the heating the apex remnant. The roots were attached with self-polymerizable acrylic resin to polyvinyl chloride cylinders, keeping 3 mm of the root exposed to simulate the biological space and enough remnant for the ferrule. To simulate the periodontal ligament space, the roots were covered with 10 layers of molding material based on polyether (impregum F – 3M ESPE, St. Paul, MN – USA). The roots were then placed transversally to the cylinders bases immersed in acrylic resin (Vipi – Ltda, Pirassununga - SP) with the aid of a liner. Following resin polymerization, the specimens were randomly divided into three groups according to ferrule thickness: Group I – without ferrule; Group II – 1 mm thickness and 2 mm height; and Group III – 2 mm thickness and 2 mm height. The ferrule was prepared with diamond tips number 1051 (KG Sorenson), measuring 2 mm from the incisal border. Thickness was verified with a digital pachymeter (Coolant Proof Absolute – Mitutoyo) according to the following measurements: 0 mm, 1 mm and 2 mm. The following sequence was adopted for the posts cementation procedure: Posts cleaning with alcohol and air drying for 1 min; application of the silane Prosil, application of the universal adhesive all bond (Bisco - USA) over the post (Reforpost – Angelus, Brazil), and application of a mild air jet to remove excesses and to evaporate solvent; photopolymerization of adhesive for 10 s; phosphoric acid 37% conditioning of the coronary portion for 15 s, abundant rinsing with water and removal of excess water with absorbent paper cone; application of the adhesive system to all canal walls and to the coronary portion; after 15 s, a mild air jet was applied for 5 s, the excess adhesive was removed with absorbent paper point and the system was photopolymerized; the resinous cement Duo-link (Bisco - USA) was directly applied to the root canal and a small amount was applied on the post; the post was inserted so that 15 mm was placed within the root canal. The dental remnant was subjected to a new adhesive treatment as previously described and the post's coronary portion was again cleaned with alcohol followed by the application of the silane Prosil aiming at the preparation of the nucleus coronary portion with the composite resin Filtek Z350 XT (3M ESPE, St. Paul, MN – USA), according to the manufacturer instructions. Shape and dimensions of the core coronary portions were standardized with polypropylene matrices obtained from the coronary portion of a previously prepared specimen molded in condensation silicone. The matrices were filled with the composite and placed on the tooth's coronary portion. The excesses were then removed, and each face was polymerized for 40 s. The matrix and the post-polymerization excesses were removed, and the samples were stored in distilled water at 37°C for 24 h.
The specimens were placed in a metal device in a plane inclined at 45° relative to the base so that the long axis of the tooth were subjected to a force applied at 135°, simulating the occlusal relation between the upper and lower anterior teeth. Compression load was applied by a Kratos universal testing machine (KRATOS K2000, São Paulo, Brazil), at a speed of 0.5 mm/min, using a steel tip with rounded end and 2 mm diameter, which adapted to the slot at the lingual region. After the compression test, the teeth were submitted to fracture mode analysis with a stereoscopic magnifier at ×40 magnification. The fracture types were classified as: favorable fracture - fracture occurring at the amelo-cementary limit or above it; unfavorable fracture - fracture occurring below the coronary portion. Statistical analysis consisted of ANOVA and Tukey's tests using the software Statistical Package of the Social Sciences 21 The significance level was defined as 5%. Mean and standard deviation for the three groups are given in [Figure 1]. ANOVA showed a significant difference between the groups (P ≥ 0.05). However, Tukey's test showed significant difference only between Group III (less resistant) and the other groups (P < 0.001). The fracture pattern was established by visual inspection. All groups show similar fracture mode, with predominance of the coronary fracture (favorable) involving the composite resin [Figure 2]. The null hypothesis – the ferrule thickness did not influence the resistance to fracture of the teeth endodontically treated and restored with glass fiber post and composites - was not accepted. The lesser resistance to fracture of Group III can be associated with the decrease in the composite resin thickness at the coronary region. Considering that the ferrule thickness is associated with the type of restoration and to the tooth preparation, it is possible to affirm that this study shows satisfactory results since, in clinical conditions, following preparation, the ferrule would be 1 mm thick, corroborating Samran et al., who assessed the ferrule location influence the resistance to fracture, using a 1 mm thick ferrule. Regarding the ferrule height, we used 2 mm according to the recommendations found in the literature;, however, it is worth stressing that in many clinical conditions the preparation of a 2 mm height ferrule is difficult. Contrarily to some studies,,,, our results show that the group without ferrule showed good resistance to fracture compared to the ones with ferrule, corroborating Magne et al., results. These findings may be related to the adhesion of post, cementing agent, and dental tissues. This triad associated to the coronal resin used in the filling nucleus preparation would form a monoblock system, with a reinforcement effect on the dental remnant, increasing its resistance to fracture.,, Samran et al. reported a significant increase in the resistance to fracture with the increase in the ferrule height; however, the ferrule thickness was not assessed. According to Juloski et al., the literature does not provide concrete information on the ideal thickness of the splint. He also states that the thickness would be directly related to the remaining tooth structure after the endodontic treatment and the amount of dentin that needs to be removed during the preparation of the crown; the design of the cervical term and the type of crown. Therefore, further investigations would be required claiming prospective long-term clinical trials with accurate assessments of the dental remnant after a crown preparation to provide strongly reliable parameters. 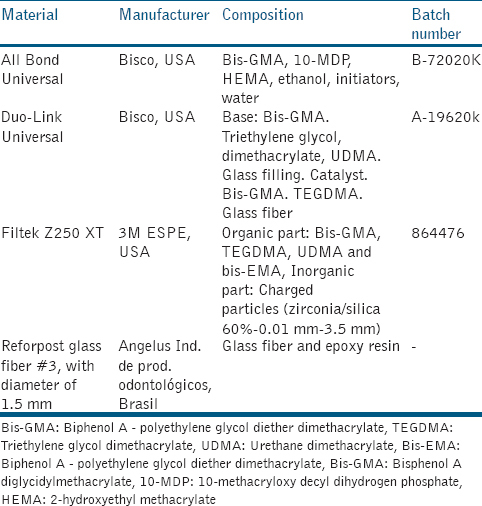 On the other hand, the fact that we adopted as a cementing protocol with universal systems: Universal Adhesive (All-Bond Universal - Bisco) and universal cement (Duo Link Universal - Bisco) both having in their composition the 10-methacryloxy decyl dihydrogen phosphate (10-MDP), which has the capacity for chemical adhesion, may have influenced the results obtained. Furthermore, having union by mechanical bonding also established chemical bonding between the restorative system, which may have increased the bond resistance and consequently the fracture resistance independently of the presence or absence of splint, in the different evaluated conditions. 10-MDP contains a polymerizable methacrylate group and a phosphate group able to create a stable salt with the hydroxyapatite calcium, promoting a chemical bond. The stability of this calcium salt has been correlated with the high bond resistance of 10-MDP to enamel and dentin., In addition, 10-MDP is a hydrophobic molecule that can confer hydrophobicity to the adhesive, decreasing its permeability to water. This seems to be essential for the preparation of filling the core with glass fiber posts and composites because it decreases the adhesive failure with the deproteinized root dentin, particularly in teeth without ferrule or with shorter and/or thinner ferrules. The results of the present work show a lack of adhesive failures between composite and dental tissues and between the composite and the fiber post in teeth without ferrule or with thinner ferrule, in addition to a larger resistance to fracture in comparison to the group with the thicker ferrule. All groups show favorable fracture mode, agreeing with Clavijo et al., and Franco et al., data. The findings can be associated with the type of post used and to the cementing agent since the group without ferrule also shows favorable results. The cohesive fracture of the composite resin at the coronary portion is predominant. None of the tested samples show fractures at the dental remnant or adhesive failure with the loosening of the post or filling nucleus. The use of fiberglass posts, with an elasticity module similar to that of dentin, probably favors this type of fracture allowing an even distribution of the forces along the root. Besides, the fiber glass posts promote an effective adhesion to the dental tissues, making the occurrence of a catastrophic fracture less probable. On the other hand, glass fiber posts may not show a good adhesion to the root dentin, making the existence of a ferrule with at least 1.5–2 mm height and 1–2 mm thick around the tooth cervical region essential. Some canals are elliptically shaped while prefabricated posts are round, making the fitting to the canal walls, particularly at the cervical level, difficult. The cement film is thicker and the potential for air entrapment is higher, facilitating post decementation. In this case, ferrule presence helps to maintain the integrity and the sealing of cement/crown. Another possible interfering factor is the loss of protein (deproteinization) of the root dentin, which occurs due to the chemical disinfection endodontic protocol with sodium hypochlorite. This deproteinization hinders the micromechanical adhesion process promoted by the hybrid layer formation, which depends on the interaction, through capillarity, of the adhesive system within intrafibrillar and interfibrillar spaces of the collagen fibers. These spaces are a result of the demineralization created by the acid conditioning of dentin. Within the limitations of this study, ETT without ferrule or with 1 mm thick ferrule show satisfactory resistance to fracture, capable of avoiding catastrophic fractures. We sincerely thank Angelus Industry Dental Products S/A, by giving the glass fiber post. Mamoun JS. On the ferrule effect and the biomechanical stability of teeth restored with cores, posts, and crowns. Eur J Dent 2014;8:281-6. Lima AF, Spazzin AO, Galafassi D, Correr-Sobrinho L, Carlini-Júnior B. Influence of ferrule preparation with or without glass fiber post on fracture resistance of endodontically treated teeth. J Appl Oral Sci 2010;18:360-3. Samran A, El Bahra S, Kern M. The influence of substance loss and ferrule height on the fracture resistance of endodontically treated premolars. An in vitro study. Dent Mater 2013;29:1280-6. Samran A, Al-Afandi M, Kadour JA, Kern M. Effect of ferrule location on the fracture resistance of crowned mandibular premolars: An in vitro study. J Prosthet Dent 2015;114:86-91. Juloski J, Apicella D, Ferrari M. The effect of ferrule height on stress distribution within a tooth restored with fibre posts and ceramic crown: A finite element analysis. Dent Mater 2014;30:1304-15. Ferrari M, Vichi A, Fadda GM, Cagidiaco MC, Tay FR, Breschi L, et al. A randomized controlled trial of endodontically treated and restored premolars. J Dent Res 2012;91:72S-8S. Ma PS, Nicholls JI, Junge T, Phillips KM. Load fatigue of teeth with different ferrule lengths, restored with fiber posts, composite resin cores, and all-ceramic crowns. J Prosthet Dent 2009;102:229-34. Roscoe MG, Noritomi PY, Novais VR, Soares CJ. Influence of alveolar bone loss, post type, and ferrule presence on the biomechanical behavior of endodontically treated maxillary canines: Strain measurement and stress distribution. J Prosthet Dent 2013;110:116-26. Magne P, Carvalho AO, Bruzi G, Anderson RE, Maia HP, Giannini M, et al. Influence of no-ferrule and no-post buildup design on the fatigue resistance of endodontically treated molars restored with resin nanoceramic CAD/CAM crowns. Oper Dent 2014;39:595-602. Magne P, Goldberg J, Edelhoff D, Güth JF. Composite resin core buildups with and without post for the restoration of endodontically treated molars without ferrule. Oper Dent 2016;41:64-75. Hempton TJ, Dominici JT. Contemporary crown-lengthening therapy: A review. J Am Dent Assoc 2010;141:647-55. Fragou T, Tortopidis D, Kontonasaki E, Evangelinaki E, Ioannidis K, Petridis H, et al. The effect of ferrule on the fracture mode of endodontically treated canines restored with fibre posts and metal-ceramic or all-ceramic crowns. J Dent 2012;40:276-85. Feitosa VP, Ogliari FA, Van Meerbeek B, Watson TF, Yoshihara K, Ogliari AO, et al. Can the hydrophilicity of functional monomers affect chemical interaction? J Dent Res 2014;93:201-6. Van Landuyt KL, Yoshida Y, Hirata I, Snauwaert J, De Munck J, Okazaki M, et al. Influence of the chemical structure of functional monomers on their adhesive performance. J Dent Res 2008;87:757-61. Yoshida Y, Yoshihara K, Nagaoka N, Hayakawa S, Torii Y, Ogawa T, et al. Self-assembled Nano-layering at the adhesive interface. J Dent Res 2012;91:376-81. Su B. Principles of Adhesion Dentistry. India: AEGIS Publications; 2013. Franco EB, Lins do Valle A, Pompéia Fraga de Almeida AL, Rubo JH, Pereira JR. Fracture resistance of endodontically treated teeth restored with glass fiber posts of different lengths. J Prosthet Dent 2014;111:30-4. Santos AF, Meira JB, Tanaka CB, Xavier TA, Ballester RY, Lima RG, et al. Can fiber posts increase root stresses and reduce fracture? J Dent Res 2010;89:587-91. Ho YC, Lai YL, Chou IC, Yang SF, Lee SY. Effects of light attenuation by fibre posts on polymerization of a dual-cured resin cement and microleakage of post-restored teeth. J Dent 2011;39:309-15. De-Deus G, Murad C, Paciornik S, Reis CM, Coutinho-Filho T. The effect of the canal-filled area on the bacterial leakage of oval-shaped canals. Int Endod J 2008;41:183-90. Signore A, Benedicenti S, Kaitsas V, Barone M, Angiero F, Ravera G, et al. Long-term survival of endodontically treated, maxillary anterior teeth restored with either tapered or parallel-sided glass-fiber posts and full-ceramic crown coverage. J Dent 2009;37:115-21. Zhou L, Wang Y, Yang H, Guo J, Tay FR, Huang C, et al. Effect of chemical interaction on the bonding strengths of self-etching adhesives to deproteinised dentine. J Dent 2015;43:973-80.